That doesn't sound right at all... have you raised a ticket with them to investigate? Hooter: Well I got connected yesterday on the $79 ADSL plan and so far it's extremely disappointing. Download speeds seem to be throttled to 200kB/s. Last night a single download maxes out at approximately 200kB, two downloads and they settle to approximately 100kB each, four downloads 50kB each etc. My other provider the day before I was getting just over 1MB/s. The line attenuation is fine. Also trying to do anything else while downloading, even just web browsing is hopeless. I checked again this morning and no change still leveling off at 200kB. If it was congestion or anything else I would expect it to fluctuate not settle to a rather consistent 200kB. Really disappointed BigPipe, so far it's a very bad value. Possible they have put you on the wrong profile and you throttled to the basic 1Mbps plan. 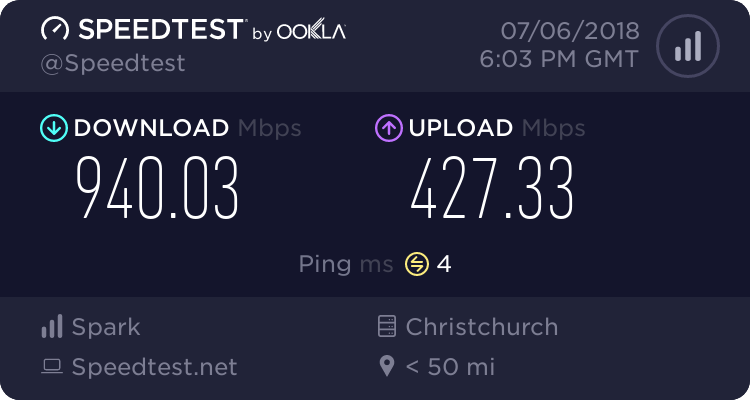 What does a speedtest to a NZ server give you? what the other guys said. Sounds a lot like you are on the wrong plan by mistake. We don't have any congestion or throttling. Have you already raised a support ticket yet through our site? That's the best way to get things investigated and resolved. We prioritise connectivity issues so you'll get a pretty speedy response and you won't have to wait on hold. I've raised a ticket. I'm at work now so can't go to download test site. But if it's packet shaping/throttling which I think it is the download test websites will surely all be whitelisted for full speed aye? We don't do any packet shaping or throttling. At all. Thanks for raising the ticket, I'll leave it with our guys to look into. Where are you teating downloads from - tried any other sites? i had speed issues on Windows 8.1 update 1 it would cap all SSL traffic to 200KB/s max per thread i couldnt figure out what was causing it, tried many things so gave up an just reformated and it fixed the issue. How does one go about signing up for BigPipe on a second line? All the options on the website seem to indicate that it'll result in a churn from the current provider. Lorenceo: How does one go about signing up for BigPipe on a second line? All the options on the website seem to indicate that it'll result in a churn from the current provider. You'll need to already have a second line in place (i.e. all the wiring, jack points etc). If it requires new wiring we don't include that. Then just drop our support team a note about it and then when you sign up we can make sure it goes through on the second line correctly. All the wiring within the house up to the demarc point is done. There may or may not be a connection back to the exchange/cabinet on Chorus's side of the lead in cable. I suspect not though as there has only ever been one phone line/dsl connection at my current address as far as I'm aware. Would there still be no charge to connect in this situation? Signing up presumably BigPipe take as authority to initiate a churn from the current ISP at a given address? Seems a bit risky to me to submit a request for an address + a support ticket and hope that the ticket is read before a churn is initiated. Why do I want it on a second line? My sync speeds aren't amazing and I've done everything on my end I can to improve them. Having two connections would mean better speeds with the added bonus of greater redundancy. Lorenceo: All the wiring within the house up to the demarc point is done. There may or may not be a connection back to the exchange/cabinet on Chorus's side of the lead in cable. I suspect not though as there has only ever been one phone line/dsl connection at my current address as far as I'm aware. Would there still be no charge to connect in this situation? not 100% sure. i think not, but we'd let you know ahead of time if there is, and you'd have the option of not going ahead if that is the case. if you prefer, you can submit the ticket first, wait for a reply, then do the sign up. Its the same people answering the tickets that do the provisioning, so it won't get missed. Kudos to BigPipe. I'm back to the same speed I had with my previous supplier. BigPipe had "Chorus reset my port". I'm guessing I was wrongly provisioned with the settings for the $69 plan and was throttled to 1Mbps (strictly speaking that's 128kBps, so I'm assuming they give some headroom/overhead). Anyway it all got sorted in one day. Hooter: Kudos to BigPipe. I'm back to the same speed I had with my previous supplier. BigPipe had "Chorus reset my port". I'm guessing I was wrongly provisioned with the settings for the $69 plan and was throttled to 1Mbps (strictly speaking that's 128kBps, so I'm assuming they give some headroom/overhead). Glad it's all sorted. Sorry for the inconvenience.